Following Jesus is about potential. So often we stop at salvation, which of course is huge but we shortchange what happens next. We are deputized to be part of God's plan for the world. The plan to make everything right. In Acts we see the followers receive their mission: to be witnesses of this Jesus. In this they are told to wait for a gift. The gift is the Holy Spirit. God's Spirit is the animating and creative force behind us that allows us to be witnesses. The Spirit is potential. The Spirit first manifests as fire. Throughout the Bible fire is used to symbolize the presence of God. In the Spirit God comes close. It starts with saying "I'm in." In saying "I'm in" we are opening ourselves up the work of the Spirit and the potential of following Jesus to play out in our lives. For some of us we have stated this already. Perhaps in baptism, confirmation or a prayer of response. Others of us have yet to make this statement. We celebrate baptism and always will. But as a new church how do we say that "I'm in" and I'm following Jesus and calling Movement Church home? How do we mark that we are on this adventure? In marking this commitment we want to attach an object to it. This helps make things tangible and forces us to act by simply taking something. Our object is flint and steel. The most basic and necessary tool for any trailblazer crucial to survival and being able to thrive in a hostile environment. Starting with fire, starting with the presence of God is how we are able to live into the mission of helping people find and follow Jesus. So when you're ready to say "I'm in". That you are following Jesus and you are doing so with Movement as your church we have something for you because there is work to do and trails to blaze. 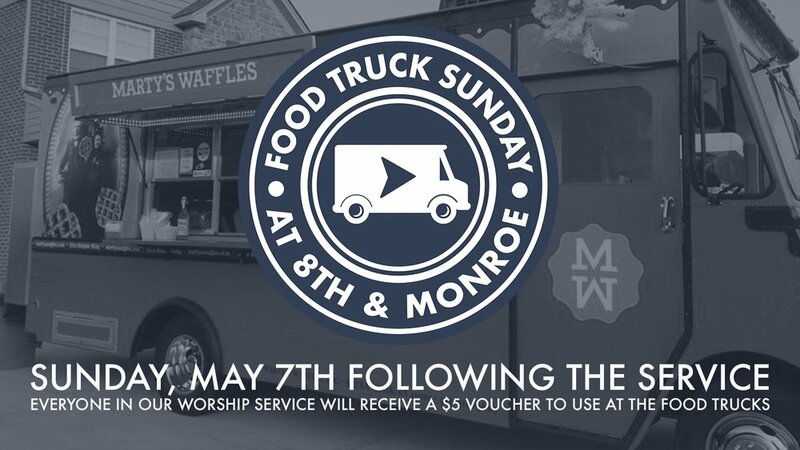 This Sunday, May 7th, is Food Truck Sunday and we are going to have some fun. Well I think we always have fun, but this week will be special. As we go through the book of Acts we see over and over again how important it is for the early church to spend time together, usually over food. So in that spirit we have invited two food trucks to 8th and Monroe: Cheese and Chong and Marty's Waffles! In a move of blatant bribery we are going to offer anyone who comes to our worship gathering at 10:30 a $5 voucher good at either truck. We will also provide water and lemonade. That said you are going to want to bring some cash because it will be really hard not to partake at both trucks. This is also a great event to bring someone with you. Maybe you've promised to buy them lunch if they come to church with you. Or they already have a church home but who doesn't like Food Trucks? Or you're running the Flying Pig in the morning and you are ready to celebrate. Whatever the reason we'd love to have you join us this Sunday, May 7th at the corner of 8th and Monroe in Newport. We gather as a community at 10:30 and eat around 11:30. RSVP here! I am so fortunate to have parents that helped me find and follow Jesus. But, if I’m honest, I could have done without the church clothes. The whole idea of wearing your “Sunday best” to worship this Jesus who was a carpenter, who hung out with fisherman, and spoke so profoundly about unlimited and unmerited grace has always seemed odd to me. Although there’s a lot we do in church culture to question. At Movement, we want to be a church for all people, so if you want to wear a tie or that dress, by all means. That said, we don’t want to create an expectation that you have to dress up for church. For Easter this year we want to give those of you not wanting to dress up a fun option. It's called T-Shirt Easter. For our Easter Sunday we are encouraging you to wear a shirt from your favorite cause, charity or organization. We see this as a great way to shed some light on some great causes and have a little fun. You can see some of our favorite causes and order your shirts here. Every Wonder Why The Bible Is So Complicated? Yeah, We Do Too. The Bible is weird. Confusing. Intimidating. But the Bible can also be absurd. Shocking. And at times appalling. The Bible tells one unified story about God. We see this fully realized in Jesus and the work of the Spirit. So it is easy to read the words of Jesus when he says: “Love your enemy” or the words of John, one of his earliest followers, when he says: “God is love”. How could a God that is love slaughter seemingly innocent people? Is this not hypocritical? You may have asked these questions. Or you’ve wondered if the God of the Bible is so great why do such horrible things happen? Where was this God of love on 9/11, at Sandy Hook, the Pulse nightclub, or your own personal experience of hell on earth. If the Bible is a collection of books about this incredible God, then what are we to do with the appalling parts of the Bible and the appalling parts of our lives? I don’t have all the answers and I probably have a lot of the same questions that you have, so over the next two weeks we are going to ask these questions together. We are going to look at these complicated parts of the Bible. Now I won’t have a nice easy answer that resolves all this, but what I do have is a complicated, nuanced, and challenging grand narrative about a God that created the universe and decides to draw close to you and me. Maybe you’ve made a decision to follow Jesus recently (or even years ago). So what’s your next step? What do you do now? For some of you…the next step is baptism. Now I realize that there is all sorts of baggage around baptism. That’s why I’d love for you to read to the end of this. Baptism is something that has marked the response of people to Jesus for 2000 years. In the New Testament every time someone started following Jesus they were baptized. And if you haven’t been baptized since you’ve decided to follow Jesus, we’d love to baptize you. 1. Obedience. Jesus said that you should be baptized when you trust your life to him. In baptism followers of Jesus get to experience something Jesus experienced. 2. You're Afraid. The fact that you’re afraid is actually a sign your should be baptized. Your biggest breakthroughs often come on the other side of your biggest fears. 3. It Will Form A Milestone In Your Life. In the same way graduation marks finishing school, marriage marks the beginning of a new relationship, so baptism marks the beginning of your new faith journey. 4. Your Baptism Is For You. For those who were baptized as children, being baptized after your decision to follow Jesus is a way of marking your decision personally. 5. God Will Use Your Story. Baptism is going public with your faith and you get to announce something powerful with a profound action. 6. Your Friends And Family Will Celebrate... And Be Impacted. When we baptize you on a Sunday, we encourage you to invite your friends and family to come with you. For many of them, this will be a rare trip to church. Who knows what God will do in them as they watch what he has done in you? 7. It’s Easy. It's a big step, so let us take care of the details. We will talk before hand to answer questions and understand your story. On the day of, we’ll get you squared away with a T-Shirt and plenty of time to take in the moment. We worry about the details so you don’t have to. So what’s keeping you from being baptized? You can start the process right now. Just click on this form. We’re already cheering for you! As we get things settled in our new space at 8th and Monroe we are rolling out this new website! We will be periodically adding posts to the blog to keep you updated on whats going on. Thanks.